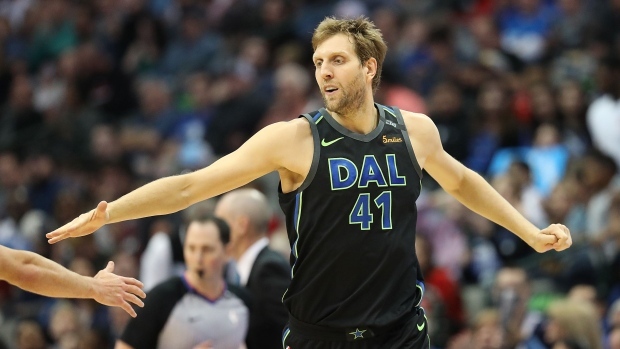 DALLAS — Dirk Nowitzki of the Dallas Mavericks became the NBA's sixth-leading scorer Monday night with another of his signature long-range jumpers. Nowitzki took Luka Doncic's handoff and backed down New Orleans' Kenrich Williams before hitting a turnaround from the top of the free-throw circle with 8:35 left in the first quarter. While Nowitzki stands only an inch shorter than Chamberlain's listed height of 7-foot-1, the two reached their point totals with contrasting styles of play. Nowitzki, meanwhile, has made nearly 2,000 3-pointers in his career, establishing the trend of big men with long-range shooting capabilities. He's an 88-per cent free-throw shooter, 37 points higher than Chamberlain's mark. "One of his real legacies is gonna be how he helped this game evolve to what it is today," Mavericks coach Rick Carlisle said. "In the '90s and early 2000s, there was a real crisis. Scoring was down. The way Dirk approached the game helped ... nudge the game along and open up space. Eventually the value of the 3-point shot to open up space became a reality. And so today, you don't hear anybody talking about how there's not enough scoring or the game's not exciting."